Astroneer update 189 is now available for download. The Astroneer update 0.3.10189.0 brings fixes for some longstanding issues as well as implemented raw logging for join errors in multiplayer games and player-facing messages for join errors in multiplayer games. The update also includes other fixes and improvements. However, the developers are still working on a highly anticipated fix to floating rovers and items. The fix didn’t make this patch due to complications resulting from an engine upgrade. Check out what’s new and fixed in this update. [AS-1082] – Implemented raw logging for join errors in multiplayer games. [AS-1083] – Implemented player-facing messages for join errors in multiplayer games. Multiplayer joining and error logging is still a work in progress, but at the very least you can now troubleshoot when things do go wrong. [AS-1159] – Rover center of gravity has been lowered, improving handling. The center of gravity change will help them to stay a little bit lower to the ground when traversing planets. Thrusters are now 10x as fun as they were before. Thrusters are still in the experimental stage, and will likely play a much bigger role when modularity is further along, but for now, use their upgraded thrust at your own peril, or enjoyment. Sprint can now be toggled on the Xbox GamePad by pressing the left thumbstick. No more broken thumbs. This is also part of the overall control and interaction refactor on the roadmap. Steam should automatically grab that build. Once it’s done, run the game. You’re now running the Experimental build of Astroneer. When you want to go back to the MAIN build, repeat these steps but choose “NONE” from the drop down list in ‘Betas’ tab. This is a Pre-Alpha Early Access version. Currently, Steam ‘Early Access’ users are receiving this update immediately. The new update will take 48 hours to reach your console or Windows 10 machine. 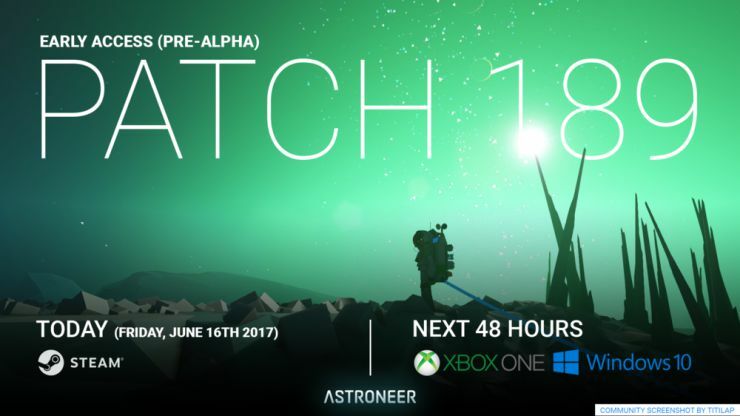 Check your game update and download Pre-Alpha Early Access Astroneer update 189.
l6qZRm Normally I don at learn post on blogs, however I wish to say that this write-up very compelled me to take a look at and do it! Your writing taste has been surprised me. Thank you, quite great post.